Acer announced its newest 34-inch QHD curved ultra-wide monitor with support for Nvidia G-Sync technology, the Acer XR341CKA. 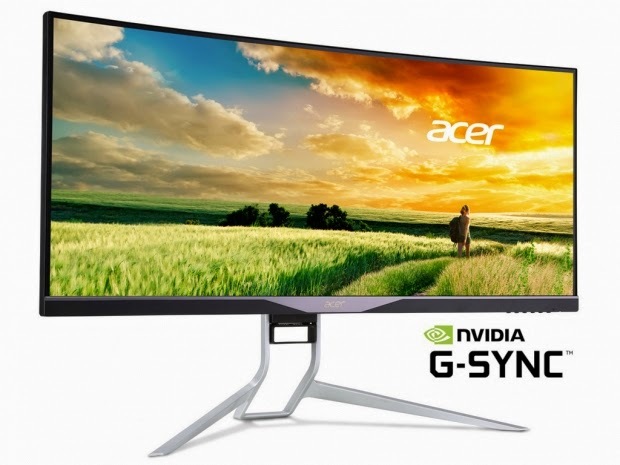 Based on an 34-inch IPS 21:9 ultra-wide curved QHD 3440×1440 resolution panel with 178-degree viewing angle, the new Acer XR341CKA is actually the first curved monitor on the market that supports Nvidia G-Sync technology. In addition to being curved, Acer also noted that the new XR341CKA monitor is also perfect for multi-monitor setups thanks to its zero-frame design. While we still do not have the full specifications, in terms of maximum brightness, contrast or response time, the new Acer XR341CKA monitor also features 100 percent sRGB color gamut, which should appeal to design professionals and photo enthusiasts. It also comes with two 7W integrated speakers with DTS audio, as well as HDMI and DisplayPort inputs and a USB hub. The stand of the Acer XR341CKA allos it to be tilted from -5° to 35° and adjusted vertically up to 130 mm.